Last time I posted, I showed you the neat project making placemats with the Soft and Stable product, and some gorgeous batiks . . . They're finished just in time for the birthday girl's special day! You can see I was even auditioning them for my round table . . . no, I'm not keeping them, but I just might make a set for myself! I'm over the moon happy with how these turned out. I love the Hoffman batiks -- the colors and patterns are just beautiful! I hope you will try this project, too, and let me know how yours turn out! 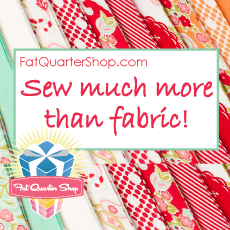 Fat Quarter Shop blog hop! If you jumped over here from FQS or one of the other blogs, welcome!! This is awesome stuff! Our project was to create placemats using the free pattern on the Soft and Stable package. I had some lovely batiks left from another project, so I used them for the light, medium, and dark tones mentioned on the pattern. 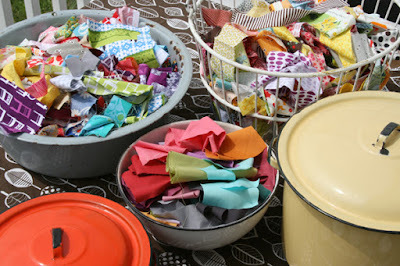 It becomes a quilt-as-you-go project, as you "sew and flip" the strips until you have covered the sheet of stabilizer. It's almost like sewing on a sheet of foam, but it's much more forgiving, and easier to handle! When you finish the top, just add a piece for backing, and bring the edges around to make a faux binding on your place mat. You can see I had some issues there....even my walking foot didn't want to cooperate, so I think I shall do a small amount of unsewing and baste it down, then sew. Now the edge is much better! I basted those bad boys down and stitched them into submission! I'm sure all of you Lilypad followers will have no trouble -- I was actually scrambling to finish this and head out of town for a meeting! (Grin) One of these days, I'll retire . . . . 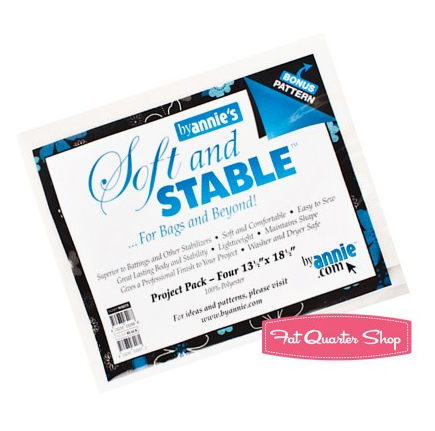 Enjoy the other bloggers' posts, check out the Fat Quarter Shop blog, and be sure to try out the Soft and Stable product. Here is a link to find it at the Fat Quarter Shop! I can see this product making Christmas gifting quick and easy, and there are many other choices of fabrics and occasions. Everyone loves to dress up their table, so get some of the Soft and Stable and try it soon! I have a wonderful way for you to use them! See these adorable babies sleeping snuggled with a heating pad? I'll pawse for a moment so you can "Awwwww." 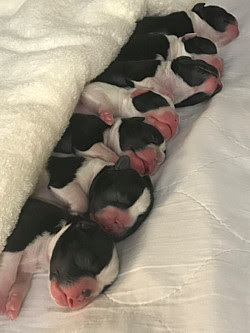 These adorable babies were rescued from a puppy mill in Florida, and the folks at Quilt Pattern Magazine's Small Kennel Quilt Team have asked for everyone that can help, to grab some stash and put the pedal to the metal! These cuties need some small kennel quilts to soften their beds -- they need to be washable and sturdy! Here is a link to the form that you can print and include with your kennel quilt. Check out this link for some great instructions, and be sure to photograph your donations and post them on the Facebook page. We can all feel good about helping with this effort!